Someday, when the field of space architecture becomes a full-time, widespread discipline, university-level programs will train its professionals — and Out of This World: The New Field of Space Architecture should be one of the primary textbooks. The most important service the book provides — for aspiring space architects or science fiction writers alik — is to lay out the vocabulary for building in space and to explain the constraints that off-Earth environments pose to anyone building structures there. 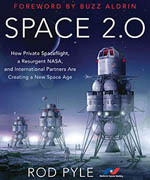 The book introduces the basics of the field to the Earth-based architecture student interested in doing space projects. 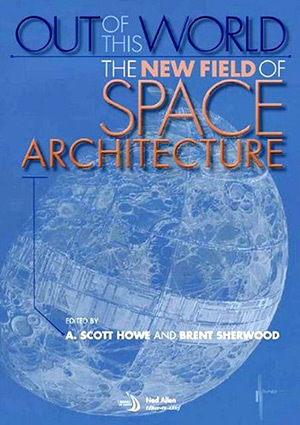 It covers four major subject areas: Introduction to Space Architecture, Orbital Architecture, Planet Surface Architecture, and Earth-Based Space Architecture. Out of This World assumes a certain amount of knowledge or interest on the part of the reader. It assumes that the individual has a basic grounding in Earth-based architectural practices and terminology and that the reader is new to the field of space architecture. Part 1 introduces space architecture by explaining some of the environmental and “human factors” issues (physiological, psychological) that make it fundamentally different from Earth-based architecture. It describes the interactions between the various systems needed to keep people alive in space like power and life support. This part also lays out the types of structures space architects would likely be called upon to build, including orbital and planetary habitats. Part 2 discusses orbital architecture, beginning with its environmental constraints—radiation, vacuum, and free-fall—and how they can affect human habitation in orbit. This section moves progressively from what has been done for human spacecraft and structures up to and including the International Space Station (ISS). The section then reviews current development work (like TransHab, which was tested but not deployed) and structures that could come next, such as orbital hotels or rotating space stations with artificial gravity. What impressed me most about this part was the care taken to address practical concerns like space-sickness, disorientation, and even using basic things like ladders in a rotating environment. For example, rather than using a straight-up ladder, as seen in the centrifuge in the movie 2001: A Space Odyssey, the book recommends creating ladders that look more like ramps to account for centripetal gravity. Anyone seeking to “design” a realistic space station for a Hollywood motion picture would benefit greatly from reading this part of the book. The challenges are so daunting, in fact, that screenwriters might find that “realism” and “drama” need not be in conflict. Part 2 concludes, as does Part 3, by addressing very large structures—in this case, potential designs for cities in space. An orbital city, for example, would most likely begin as a single, linear structure like ISS, which would grow organically over time. From an architectural and practical point of view, certain activities would need to become standardized to meet human needs. For example, any orbital city would need to maximize Earthward viewing by including inverted pyramid housing structures, as well as domes on the outward-facing side for space viewing. Scientific and industrial activities would extend like skyscrapers upward and downward from the central spine, while the spine itself would include utilities and transportation access. If this structure existed in geosynchronous orbit, it eventually could grow into a complete ring city circling the Earth. One thing the book doesn’t lack is ambition! Part 3 focuses on the architecture of structures on planetary surfaces, covering environmental constraints on the Moon and Mars—no other worlds are given any treatment in the text. The book suffered a little bit in this part, as there are several chapters that repeat the lunar environmental constraints, leading readers to believe, quite rightly, that they have read the material before. Out of This World defines three types of structures for off-world habitation. Class I structures are completely fabricated and integrated on Earth; these would be the basic modules used today to build the International Space Station, and which may be used to build the first lunar or Mars bases. Class II structures are prefabricated on Earth, but partially assembled off-world; these would include inflatable structures, in which the core hardware is created on Earth, but inflated and then outfitted internally once at the intended destination. Class III structures are built from in-situ (local) resources and materials. These generally require an existing industrial capability. These three classes of structures are important because they represent the three likely maturity phases from dependence on Earth to a fully independent civilization in space. 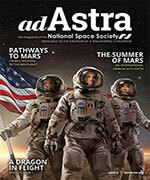 Part 4 is mostly a “spinoff” section, showing how architectures developed for space can improve life on Earth. Part 4 describes space hardware analogues being tested in Antarctica, and also space hardware adapted for use in developing countries. Space hardware has an advantage in these areas, because it is compact, low-impact, highly efficient, and long-lasting. For example, the Environmental Control and Life Support System (ECLSS) built for ISS has been used to provide a portable, clean, and safe supply of drinking water in Iraq and other countries. Overall, the book is gorgeously illustrated, with lots of diagrams, tables, photos, and artist concepts showing what has or could be done to house human beings in space. Chapter 10, for example, has dozens of colorful, imaginative computer-generate graphics depicting the interior of a TransHab-based hotel module. Other chapters include artist concepts of inflatable habitats, mobile laboratories, new spacesuits, and other marvels yet to be built. Though the space environment is unique, the basic needs of human beings remain constant. Thus, space architecture may apply 10,000 years of Earth-based practice to the next frontier of human endeavor. The serious reader should come away with a better appreciation of what is needed to develop safe, functional, and attractive places for human beings to live in space or on other worlds. Out of This World is a serious book that demonstrates how space can and should be the next frontier for developing great works of architecture.